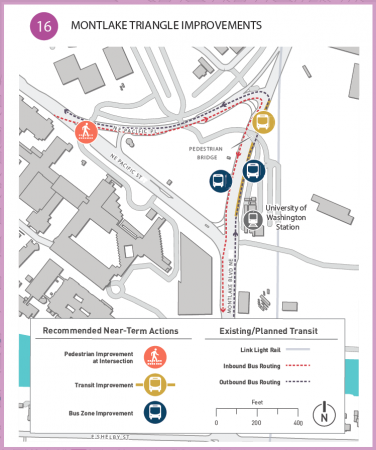 If a 255 restructure is approved, buses from the Eastside arriving at UW station will stop in front of the station on Montlake Blvd. After the stop, a new signal arrangement will hold car traffic so buses can turn left across Montlake Blvd onto Pacific Place before proceeding to University District. Buses to the Eastside will use Pacific Place to access a new southbound stop on Montlake Blvd across from the station. This reduces the number of street crossings for a round trip with bus-rail transfers from three to just one (and riders can use the pedestrian bridge for that one crossing). Transfer times will be reduced by an average four minutes each way. Those who will be most disappointed at the reduced restructure are Eastside riders to South Lake Union. Option C from the 2017 outreach included several new routes to SLU, replacing existing service to downtown Seattle. Because I-5 lacks a freeway exit that allows the transit agencies to serve SLU on the way to downtown Seattle, added service to SLU necessarily means an exchange of service hours from downtown routes. It’s unlikely Eastside riders will see more service to SLU, and they will also lose the Metro 255 stops on Stewart as that route is truncated to UW station. Many Redmond riders will note the missed opportunity to add more frequent service on their often crowded buses. Routing Metro 255 to UW frees up abundant service hours and the next round of outreach will explore options for deploying those hours. Route 255 has about 68,000 annual hours today, some 20-25,000 of which would be conserved by having the bus not proceed all the way through downtown. The delays if it were moved from the tunnel to service streets would add an estimated 8,700 hours. All of those hours will be available for improving Kirkland service. The options outlined in last year’s public outreach invested those hours into improved frequency and more service to Kirkland on evening and weekends. More frequent cross-lake service alleviates overcrowding on the busiest part of the route. It also reduces wait times for transfers. 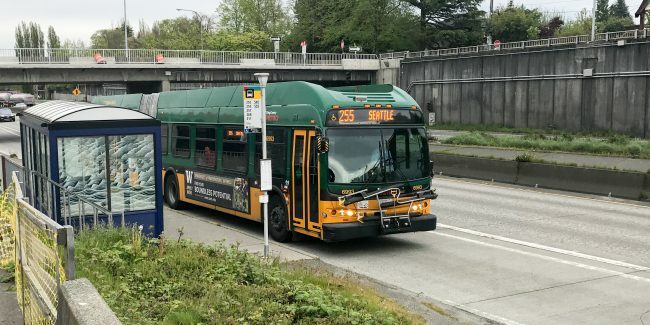 The City of Kirkland is recommending more frequent service on routes that connect to the 255. Kirkland also seeks a simplification of the 255 routes which currently operates in three flavors. A peak-only version operates between Seattle and downtown Kirkland. There are two all-day versions, half of which goes to Totem Lake transit center, and half to Kingsgate P&R and Brickyard P&R. Kirkland is requesting a single flavor including service to Brickyard. The Kirkland recommendation is better for riders from low-frequency connecting routes and for riders from North Kirkland where 255 service is less frequent. There is particular sensitivity to current two-seat riders who will have a three-seat trip if the 255 goes to UW. But it expends more resources into places with low demand. The 255 segment to Brickyard has such low ridership that Metro has attempted to eliminate it at least three times in recent years (the cancelled Metro service cuts in 2013; the cancelled U-Link Eastside restructure in 2015; and under either alternative offered in 2017. Kirkland has also asked that ST 540, currently serving downtown Kirkland to UW, run to South Lake Union instead. That may be a popular option for riders, particularly as other opportunities to reach SLU from the Eastside have been dropped from the restructure. With just 18 runs each way per day, the available service hours are limited however. A round of public outreach is expected this Spring to inform the final service decisions. The King County Council will approve the final service proposal early in 2019, and implementation is anticipated before the closure of the transit tunnel, expected in Fall 2019. This way, riders north of Totem Lake retain two-seat ride to downtown with a frequent transfer to 545, South Kirkland riders retain direct access to downtown, 545 riders have to wait through one more stop, but potentially with more frequent peak service. 540 riders can use revised 255, with marginally slower service due to local stop spacing. A S. Kirkland P&R stop would be a terrible deviation for the 545. It would add close to 10 minutes to each run as the bus has to exit the highway, go up the hill, turn into the P&R, exit the park and ride, loop back around, turn back onto 108th and get back on the highway. You’re proposing to add 10 minutes to the commute of almost everyone on the second most heavily used Sound Transit express bus, all for an amount of people that is several orders of magnitude lower then the ridership of the 545. The 540’s service hours alone wouldn’t be enough as there’s 186 runs of the 545 each weekday, compared to only 36 on the 540, and there’s not much space on the schedule for more 545 runs, as the bus commonly bunches today during peak hours. Agreed – sending the 545 to South Kirkland P&R would be too time-consuming, and would generate a large volume of hate mail from everyone packed into it. And the only riders it would gain would be people waiting for a 255 who happen to see it come first. Even worse, South Kirkland P&R has limited maneuvering room, and can’t really accommodate many more buses per hour than it already has before buses start having to wait in line behind other buses before they can open their doors. Even though none of the routes serving the P&R today are super-frequent, there’s enough routes, that with both directions doing the same loop in the same direction, serving the same stop, the number of buses per hour really adds up. If somebody from Kirkland *really* wants to ride the 545 downtown, they can transfer to it at either the Yarrow Point or Evergreen Point bus stop along 520. Yeah, good points. 10 minutes is kind of liberal, but I think timing the 545 to come 5 minutes after the 255 makes the freeway station idea work. 235-downtown would still be three seat, but hopefully not too horrible. Alternatively, 235-550 is longer distance but fewer buses, and future transfers to Wilburton station should be convenient. Maybe we should just close S Kirkland P&R so people stop thinking about diverting express buses to it or having a separate Seattle route from it? Wow. This is the opposite of what I would have done. Off peak 255 and 545 need less than 10 minutes from Montlake to Westlake and Fifth and Pine. The 7 day service should stay direct to downtown. The main advantage of truncating off-peak is that it makes it a lot easier to get to North Seattle from the eastside. Currently, getting from Kirkland to (Fremont, Wallingford, Roosevelt, U-Village, Green Lake, etc) requires two transfers (actually 3 transfers if you aren’t on the 255 route). You need to transfer for the 48, which is up to a 10 minute wait, then transfer to a connecting bus in the U-District, which is up to a 15 minute wait. (Instead of the 48, you could walk 10 minutes, but that’s quite a long walk for a transfer.) This is very non-competitive with driving. I don’t know how many people in Kirkland are going to North Seattle vs. downtown/south/central Seattle though. I agree that truncating during peak hours makes more sense (Link will actually be faster then). It’s hard to say because there’s a feedback loop going on where better bus service to north Seattle encourages more people to ride the bus for such trips. Today, the three-side ride and downtown backtrack options are both horrible enough that very few people will use them. On other hand, if the new 255 suddenly provides connections to make most of north Seattle just one more bus away, it starts to look doable – even more so, when Link extends northward and UW->Roosevelt becomes just a 5-minute train ride. At some point you have to give in to network legibility. An off-peak only route is significantly easier to understand and plan for. I would make all the peak only buses (252, 257, 268, 311, 540, 541, 542) go to UW, and leave the 7-day routes (255, 545) going to downtown all the time. Clear and understandable. The utility of the Stewart/Denny stop is somewhat limited because the buses only stop there going one direction. Eastbound, you have to backtrack to Convention Place station, which is a bit of a trek. Stewart/Denny is also about the same distance from the center of SLU as Westlake Station is – so you can do it. I can see your point, but what Metro is doing is common, even though it seems backwards. Ideally you run buses everywhere. Run buses to the UW all day long; run buses downtown all day long. Run them both very frequently. The only drawback is that doing that is expensive. The problem is, there just isn’t enough demand in the middle of the day to do that. You increase ridership a bit by making things more convenient, but not enough to prevent empty buses in the middle of the day. The only time you would have full buses is during rush hour. That is why they do it this way. During rush hour, running expresses to downtown (as well as other buses to the UW) are very expensive, but at least there is high ridership to justify the expense. Outside of rush hour, they have a tough choice. Either run the buses less often (and make it tougher for folks headed to the UW) or run buses to the UW. Doing the latter makes it worse for those headed to downtown, but a lot better for those headed to the UW. They have a shorter trip, and one that is a lot more frequent. Even those that are headed downtown might come out ahead — yes, their ride takes longer, but the bus is a lot more frequent. It is also possible that the savings might be spread to other areas. Maybe it is a bit tougher to get from one part of Kirkland to downtown, but it is a lot easier to get from a different part of Kirkland to Bellevue. Keep in mind, this is exactly what they did in parts of northeast Seattle. All day express buses to downtown from the U-District are gone. But they still kept a handful of rush hour express buses (74, 76). The result is that lots of people do have slower trips to downtown (especially outside of rush hour) but they have much better frequency outside of rush hour. At the same time, a handful of folks still have their express to downtown, even though that is when it might actually be faster to transfer to Link. (Actually, I’m not sure if it is ever faster to transfer to Link, but at least the time difference shrinks during rush hour). So again, it seems backwards, but from a bus demand standpoint, it makes some sense. 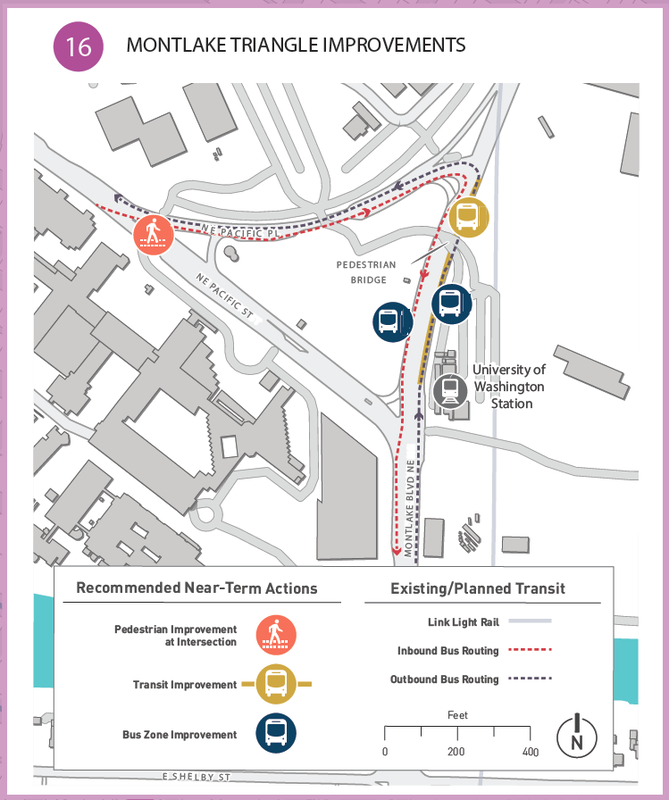 Personally I would have kept the plan for the middle of the day (it is the only way to get decent headways and also serve the UW) but I would have sent the express buses to the UW as well. I have a feeling they aren’t that confident about the transfer during rush hour. The changes to the 520 bridge might have a lot to do with it. It may not be that easy to get from the bus lane to the exit soon (if it is now) which is why they have essentially punted on the rush hour routes. During the off hours, this is less of an issue, but the other issues you raised (less frequent train service, bridge openings) will be. There’s a pattern there. Expresses south of 55th were eliminated; expresses from 55th on north were increased. That’s because U-District and Roosevelt Stations aren’t open yet. Metro made a conscious choice not to force northern peak riders onto Link because U-Link hadn’t opened yet and nobody was certain how well it would perform. The limit of how bad a transfer can be before it’s unacceptable is a values judgment and it depends on what passengers think after they start doing it. So with so many unknowns, Metro opted for a safe course, continuing the express buses during the transition. And as it turns out, people on the 372 and 75 have a continuing complaint about the transfer, and the 65 westbound. And some people have a continuing complaint about the Pacific Street stops, and the time it takes for buses to go down University Way. So it’s easy to see how that could turn into a rebellion if there’s no peak-express alternative. Though this is a low key service restructuring. I wished they would reroute the 311 to serve SLU/UW instead of Downtown Seattle. This is because 311 riders do have other route options to/from Downtown Seattle. Yes, concerned about the 255 rerouting during Husky Football games, when the area is indicated with many riders post game and traffic in general. Can a bus make that right turn at the Triangle if other lanes are clogged with traffic? And the 71 and 73. It looks like the new 255 bus stop is where the 44, 45, ect. currently stop under the ped bridge beside the elevator, which is in a bus only transit lane, so that right turn shouldn’t be an issue. I’m more curious to see how the left turn off of Montlake NB will work out. Is it a special signal from the right lane, or does the bus have to get over and wait in the left lane, blocking other traffic, to trigger the signal? This looks like “testing the waters” with one route to see how it goes. If successful, I’d expect other routes to be similarly revised. It’s a special bus-only signal that allows a turn from the right lane. The detour through the Montlake triangle will add several minutes to thru-riders headed to other parts of the U-district. Roughly, the time added for a thru-rider and the time saved for a rider transferring to/from Link will be about equal. In this case, it may be justified, since existing ridership patterns suggest most riders will be transferring to/from Link. It should also be noted that, even with the detour, it still obeys the Hippocratic Oath in that U-district access is still far better that it is with the status quo of Montlake Freeway Station. Hopefully, SDOT can design the bus-only left turn signal onto Pacific so that the wait times for buses are not excessive (although, given the traffic volumes on Montlake, I am not exactly holding my breath for this). Convert the 540 to a peak-hour route serving SLU. The 540 will be redundant once the 255 starts/ends at the UW. SLU is too popular of a destination to completely neglect. Truncating the 255 at UW station will force them to ride at least 3 modes of transport (255+Link+bus to SLU). SLU. Changing the 540 to serve SLU will address this issue. Having direct service to South Lake Union makes so much sense. Could even continue to Seattle Center and the Interbay. The Route number 255 always seems so arbitrary and unrememberable to me… Would Kirkland ever want to help upgrade it to a “RapidRide K”? The route has been the 255 for decades, with the same basic 520-Houghton-Kirkland-Juanita-Totem Lake routing. Originally it was one of three all-day Kirkland-Downtown routes, each of which ran only every 60 to 120 minutes, that were all numbered in the low 250s. It’s really hard for Metro to change long-established major route numbers — just ask some old-timers about the confusion that happened when the 6 turned into the 358, or the north 7 into the 49. There was a persistent clamor to restore the traditional route numbers, so when the B opened it took over the 253 (NE 8th – 156th – 148th) which overlapped with the 231 (former 226). A new 226 was created from the far-eastern part of the old 226 (east of 156th), stringing it together with other coverage tails, creating a route from Bellevue TC to Bel-Red – the old 226 route – 156th – Lake Hills – Bellevue College – Eastgate P&R. So the old 226 routing was restored, but paradoxically it now goes the opposite direction toward downtown Bellevue (i.e., north instead of south). Meanwhile a new 235 was created, on the old 235 route from Bellevue to Kirkland to Totem Lake. (I’ll ignore issues of Lk Wash Blvd vs 108th, because the route has long switched between them.) And a 234 was created that follows it to Kirkland and then goes to Kenmore. In Seattle the 30 used to be a 45th route from Laurelhurst to Fremont (and Magnolia?). It was deleted due to lower ridership than the 43 (now 44). The 74 ran on Fairview, Eastlake, University Way, the 20th-Ravenna-54th-55th mess to Sand Point. (And it was half-hourly, while the 71, 72, 73 were hourly.) It had a peak-express overlay, the same as now. The 71, 72, and 73 ran on Eastlake and had a spaghetti of express overlays, along with the 70 which was on 45th and I-5. When the DSTT opened the 71, 72, and 73 were rationalized and the 70 deleted. When trolley wires were added to Fairview-Eastlake, the current 70 was created, and the 74 local was truncated in the U-District, but the 74 Express continued as-is. Then Metro wanted to add service on N 40th Street which didn’t have it, so it extended the 74 local to Fremont (and Magnolia?). At this point the 74 local and express routing were so different it was intolerable, so the 74 local was renumbered to 30. (From a long-term U-District to Fremont perspective, the 30 was moved from 45th to 40th.) Then Metro replaced the 30 extension with new routes 31 and 32 and interlined them the upgraded 65 and 75. Then in the cuts the 30 was made peak-only and then disappeared. Last year limited midday service was re-added to 55th, but as number 74 rather than 30, matching its 1980s name rather than 2000s name. The number 30 is still unused at this point. As is the number 6, which inquiring minds wonder where it might be applied next. It’s unlikley that there will ever be a number 6 in Shoreline again, because all the single-digit numbers have retreated to the Queen Anne and Central District strongholds, except the 5 and 7 which have survived from that era. If I recall back in the days when the 74 local served N 40th and then became the 30, it went to Seattle Center, though I’m not sure whether it took Dexter, Westlake, Aurora, or cut through Queen Anne (I’m certain it didn’t go through Magnolia or took the eventual 32 routing). Thus One Center City suffers another self-inflicted defeat, new connections fail to be made, and transit riders will sit in even more traffic while nothing is done. Sigh, groan. I guess it’s a good thing I bought a car. We’ve done a great job creating a new urban center in SLU which you can’t directly access via transit from the Eastside, and you can’t walk to from Capitol Hill, because the highway that buses can’t exit from is in the way. There is a SLU exit (Mercer), but apparently buses can’t weave there from 520, and even if they could, it’s heavily congested by all the cars so many people are forced to drive because they can’t get there another way. Is this really the best we can do until 2035? And what will Kirkland-SLU commuters do then? In theory, when the long-proposed SR 520 express lane connection ramp is complete in maybe 2024, Mercer St. should be more transit-accessible from 520, only when the express lanes are open and heading the right way, but I haven’t heard that discussed with any of this planning, probably because it’s too far off. Meanwhile, what pathway does Kirkland want the 540 to take in the near term? Stewart St. to Fairview north? That could be useful; too bad there won’t be any transfers to it in Montlake because the highway level stops close permanently in about a year. I suppose you could transfer at Evergreen Point… That is, unless you are coming from the 271 which doesn’t (and physically can’t) stop there anymore thanks to limitations in the design of an interchange that was rebuilt from scratch at great expense. But that lid in Medina sure is nice! If this all seems uncoordinated to any newcomers, that’s because it is. I am happy to we will finally the upgrade of the Montlake-UW rail connection, which was first suggested well before the Link station design was complete. I don’t know why we didn’t do this to begin with so we wouldn’t have to come back later and add it, but better late than never. Seattle, Metro, and ST somehow overlooked that people would want to do that. What’s headway going to be on the Connector? Or shortest possible for existing SLU streetcar? Because if it’s short enough, streetcar transfer from LINK at Westlake Station could be faster than the bus is now. Once the Connector is open, it will be five minute headways up to Westlake and Thomas. Ten minutes beyond Thomas. Is it too much of a time sink to have buses headed to SLU on 520 take the Roanoke/Harvard exit, head west on Roanoke and then south on Boylston? This would put them in the Mercer St exit only lane on I-5 without having to cross the entire freeway to do so. It’s three traffic signals (left on Roanoke, left on Boylston, straight at Lynn) plus a ramp meter. Maybe not too bad, but then there’s congestion on the Mercer off-ramp and at Mercer/Fairview to contend with. Seems like a mixed bag. Then there’s the creative idea of getting off at Montlake, traversing through the U District, and getting back on the I-5 express lanes at 42nd St, which was proposed earlier but doesn’t seem to be getting pursued now. Imagine what we could have done if we had designed these roadways with transit in mind. Dan, say it ain’t so! You’ve drunk the Kool-Ade. As to how to redeploy the saved service hours, my opinion is strongly in favor of boosting frequency of the 255 through it’s most important segment – downtown Kirkland to Seattle. Weekday frequency of 10-15 minutes is ok, but evening/weekend frequency of 30-60 minutes is difficult to use, and this restructure finally provides the service hours to fix it. Unfortunately, it looks like (if I am reading the post correctly) that the city of Kirkland is advocating keeping the same crappy evening/weekend frequency, instead using the savings from the truncating to send every single bus (every 10 minutes or better during rush hour) all the way to Brickyard P&R. Given the ridership of the Brickyard tail today, this is nuts. And, given how long it takes the 255 to slog it out all the way to Seattle, it’s not going to attract more than a minimal number of riders anyway – one seat or not. It is better to focus the service hours on the parts of the route with more potential – downtown Kirkland to UW. I’m willing to allow the bus to go as far as Totem Lake, since there is a decent amount of population in the Juanita area. But, all the way to Brickyard, no. Metro backed off the original suggestion to cut the Brickyard tail last year. It was unpopular in public comment, and unpopular with City of Kirkland. But, yes, it would be a poor use of resources to put any more hours into the tail. The 255 3-flavor structure is cumbersome, but there isn’t any other way to (a) put some, but not too many resources into Brickyard, (b) add capacity at peak for downtown and South Kirkland, and (c) keep significant service through Juanita and Totem Lake. So I don’t want to see the spare service hours peanut-buttered all over the low ridership neighborhoods. If there are enough spare hours, I wouldn’t be averse to seeing some on the Bellevue routes though. On weekends, Metro does use the single service pattern, sending every bus to Brickyard. The tail is an unnecessary weight that’s holding back the frequency of the rest of the route. Similar to the 271’s tail in Issaquah preventing the DT Bellevue->U-district segment from running more than once/twice per hour. Regardless of what people are saying in the comments, people are voting with their feet against the tail. And for good reason – the 255 is so slow and so meandering that at the same time it’s scheduled to leave Brickyard P&R, you could get in your car, drive to South Kirkland P&R, and very nearly catch up with the bus that left Brickyard an entire half-hour ahead of you. And, given the ridership numbers, that is probably exactly what the vast majority of the bus riders in the Brickyard neighborhood are doing. And, on weekends, there is plenty of parking available to accommodate them. The 255 Brickyard service is also just a glacial way to get to downtown given how long that bus takes to wind it’s way through all of Kirkland at 25mph. I’d almost rather see an all day 311 going to downtown that serves the freeway stops and local feeder bus service to the two big PRs with the 255 terminating either at Totem Lake or even Downtown Kirkland. To put it in perspective if you can use either Brickyard or Kingsgate (usually full) depending on timing its in many cases quicker to take the 532/535 to Bellevue and *transfer* to the 550 than ride direct. That will only improve further once EastLink opens. BTW on weekdays if time savings is your goal if you miss the last 257 in the morning it’s often more efficient to *sit* on 405 in your car and drive to South Kirkland and intercept it there than to take the 255 from Brickyard. By 8:30 or 9AM the HOT lanes are also often down to 75c. Only folks getting on 255 @ Brickyard after the last 257 leaves seem to be those who can’t drive, or those like me who don’t want to (I love my morning bus reading) and that’s a small group. The diagram shows the 255 going west of the Triangle. Which makes sense since surely, it wouldn’t be making a U-turn anywhere near there, so it must be running further west than just UW Station. If it runs to Campus Parkway, transferring to the 70 would be a solid option for getting to SLU, as well as direct service from the east side to The Ave and that part of campus. Once you’re already at the Link station, I think you can actually get to SLU more quickly by riding the train than staying on the bus to campus parkway and riding the 70. The train is fast enough and frequent enough that you’d basically be pulling into Westlake station by the time would have been just getting on the #70 in the U-district. From Westlake, you have many more options (40, 62, 70, C-line, streetcar) – in particular, options that are likely to get closer to the specific part of SLU you’re trying to get to, unlike the #70, which only skirts the periphery of SLU at Fairview and Denny. Worst cast, you always walk it in 10-20 minutes and be guaranteed to get where you’re going, even if the buses are totally messed up. Switch to the #70 in the U-district, you lose that flexibility, and subject yourself to additional delays from traffic congestion and ship canal openings. Anecdotally, I have traveled before, from the entrance to UW Station to the Whole Foods at Westlake and Denny in door-to-door under 20 minutes (Link to Westlake station, followed by a brisk walk). Note the Executive Constantine Executive order of 2014 to integrate with ST high capacity transit (e.g., Link and South Sounder). How did the political handlers lose track of that? It was quite sensible. Both agencies should ask their riders about it. After a public process, they might compromise. The SR-520 restructure should not be about One Center City at all. The existing pathway via the I-5 general purpose lanes is already broken and getting worse, slower and less reliable. The Legislature shows no sign of tolling I-5, so that pathway will worsen. Using Link for routes oriented to downtown Seattle is already the better choice for riders and the network. If it makes sense for Metro routes to feed Link, it makes even more sense for ST routes to feed Link. Link is the future; Link is great; Link will be greater! The region has been envisioning this type of restructure since the early 1990s. Link takes about six minutes between the UW and Westlake. The travel time between Evergreen Point and mid town is slower, unreliable, and getting worse, when compared with a more frequent East network connecting with Link. ST should run its trains more often at off-peak times. The whole slew of one-way peak-only routes dates from the 80s; it is out dated. Eastside riders want to get to many places and need better frequency and reliability to do that. The agencies could provide a simple consolidated frequent network with Link at its core. All the bus hours between Montlake and South Jackson Street could be better used east of UW Link to reduce wait times and attract more riders and not sitting in congestion. There is another elephant in the room coming, and that’s the looming closure of Montlake Freeway Station. If nothing is done, every evening/weekend transit trip into Seatte from Redmond or Kirkland would be forced to go through downtown – even trips to the UW – which would add considerable time and hassle. Even a transfer to the 271 at Evergreen Point is not a possible workaround because the 271 does not stop there. The good news is that this is not scheduled to happen until spring 2019, so hopefully the 255 will already be going to the UW station first. If nothing changes for Redmond service, this would mean a forced transfer to/from route 255 at Yarrow or Evergreen Point freeway stations. If neither route sees weekend service frequency improvements (e.g. the savings from truncating route 255 are all squandered on the Brickyard tail), this would result in a 15-20 minute wait between buses – in both directions, every single trip. I’m not sure if the officials at Metro and Sound Transit are even thinking about the Montlake Freeway station closure happening around the same time as the “period of maximum constraint” downtown, but if they’re not, they should – people are going to be in for some ugly surprises if the freeway station closes, and the routes they are supposed to be using for alternative service are running only during the weekday daytime period.